Shake Your Hair™ Hair Growth Protein Shake Each delicious serving of Shake Your Hair Protein Rich-Shake provides 26 grams of Protein and a complete balance of protein, vitamins, minerals, enzymes and amino acids, offering nutritional support for beautiful healthy hair. process very similar to that used for the production of “soft” water. and is then concentrated to achieve the desired product. free of MSG and other Exitotoxins. Now that you've got the best tasting most effective whey protein hair shake available on the market you can get really creative and make some delicious and tasty shakes. Shake, Blend or Stir and enjoy! Please note you may use water in lieu of milk or juice for any of the recipes. NZURI Shake Your Hair™ Hair Growth Whey Protein Shake. Each delicious serving of Shake Your Hair Whey Protein Rich-Shake provides 26 grams of Protein and a complete balance of protein, vitamins, minerals, enzymes and a whopping 18 amino acids, offering enhanced nutritional support for beautiful healthy hair. Take it with you to school, to work, or to the gym. Instant Mixing- Just stir with a spoon, no blender required. For even greater results. Take along with Nzuri Supreme 18 Digestive Enzymes because the enzymes are a great product to take for absorption of all the nutrients in the foods you consume. They will also aid in properly breaking down the enzymes in the protein for maximum absorption of this shake and all the nutrients you consume daily. Protein is composed of the amino acids essential for the building of new cells, including hair. With over 18 Amino acids that are of particular relevance to hair growth - cystine, cysteine, methionine, arginine and lysine and others. Inadequate protein intake over a lengthy period can force hair into the resting phase with shedding a few months later. It is obvious then that sufficient portions of protein rich foods should form part of your daily diet. Hair is made of protein which originates inside the hair follicle. As cells mature, they fill up with a protein called keratin in the form of fibers. This protein formation process – Healthy Hair Growth requires 8 essential amino acids to be present at the same time. As these cells get filled with keratin, these cells lose their nucleus and die as they travel up the hair follicle. This process essentially describes hair growth. Approximately 91 percent of the hair is protein made up of long chains of amino acids joined to each other by chemical bonds called peptide bonds. There are various elements found in the hair and they are used to make amino acids, keratin, melanin(a pigment that gives color to the hair and skin), and protein. The keratin found in hair is called "hard" keratin. This type of keratin does not dissolve in water and is quite resilient. What is keratin made from? 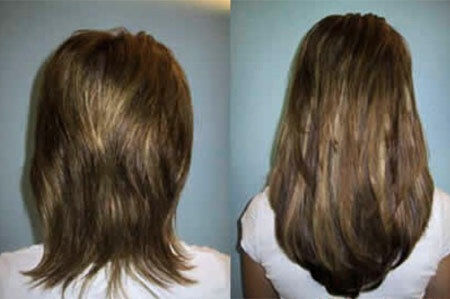 Keratin is an insoluble protein made from eighteen amino acids. The most abundant of these amino acids is cystine as found in the Nzuri Shake Your Hair Protein Shake which gives hair much of its strength. If all 8 amino acids are not present in the right quantities or proportions, your hair does not grow as fast or as well as it should grow or could grow. The best example I can give is to take a look at a house plant that has been nurtured with plant food compared to an equal plant that has not. The difference of the two plants will be the nutrient rich, plant food fed plant will be noticeably healthier and more vibrant than the other plant that relied soley on water for life. Notice how much faster they grow, how green and healthy the plants become when they are fed the plant food. The same application applies to your hair and aiding the growth of your hair by supplementing your diet with the Nzuri Shake Your Hair Whey Protein Shakes because it has these amino acids in the optimum proportions. This product is focused on supplementing the missing protein and amino acids you may not be getting from your daily diet. For maximum benefit you may want to supplement this shake with the Supreme 18 Digestive enzymes for maximum nutrient absorption and the Kra-Z hair gro vitamins. The average composition of normal healthy hair is composed of 45.2 % carbon, 27.9% oxygen, 6.6% hydrogen, 15.1% nitrogen and 5.2% sulphur. L-Cystine - Food sources: Brewer's yeast, whole grains, egg yolks, liver, rice and milk, kidney, breads, fish, nuts, beans, meat and dairy products are all good sources of biotin. Food processing techniques can destroy L-Cystine. Note: Keratin – a fiber protein characteristic of horny tissue; hair, nails, feathers etc. it is insoluble in protein solvents and has a high sulfur content. This is a great protein shake mix, very tasty and I am seeing immediate results! I mix it each morning with Very Vanilla Soymilk, and I swear it tastes like a French Vanilla shake from Dairy Queen! The texture of my hair has changed(no more pressing! No more split ends! ),and grows so Fast! Love the taste. Too early to experience any results. Really like the taste of this product. Products arrived quickly, however, I am having trouble managing my account. It is showing that I have not made any purchases from your company. It would be wonderful if someone would contact me by email to discuss. Thank you for your products.